Working with Designed Architectural Lighting (DAL), the company behind the DAL BALTIC spotlights, the gallery created the IKON LED Washlight. 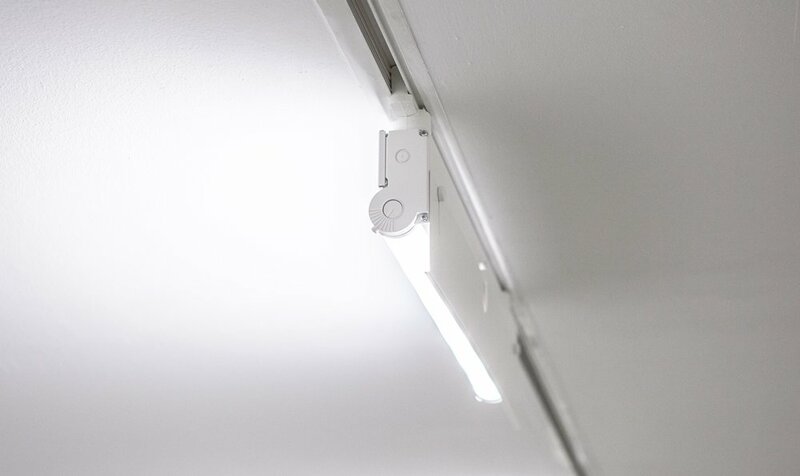 First installed throughout the galleries in autumn 2017, the IKON LED is now a bona fide product and has recently also been installed in Birmingham Open Media (BOM), a mixed-use art space and Arts Council NPO (which is currently being refurbished) to solve its needs for autistic visitors. Not surprisingly, it’s also now starting to catch the eye of other galleries across the country. 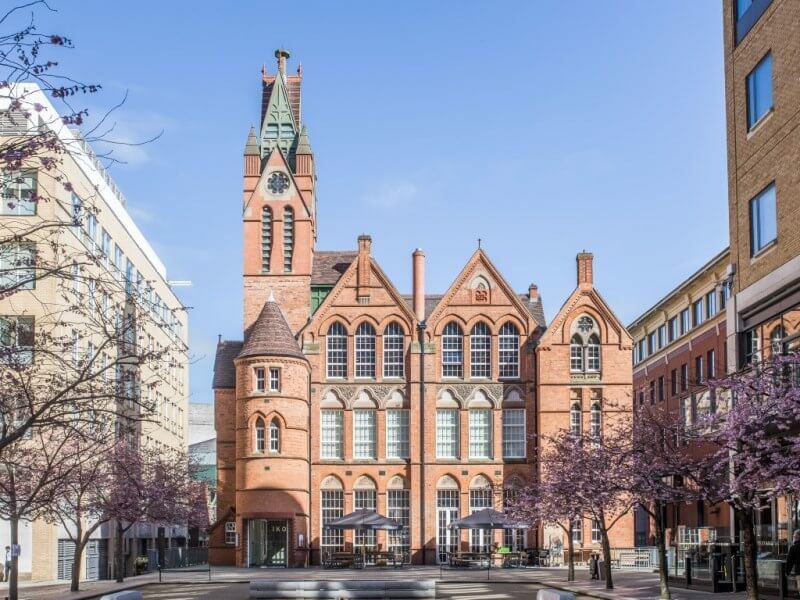 Ikon gallery was established in 1964 and moved to its current location, a Grade II listed Victorian school built in 1877, 20 years ago. The old, red brick building had gone through many iterations before it became derelict in the 1990s and was one of the only buildings standing when the whole area was redeveloped. It was then transformed by Levitt Bernstein Architects into a contemporary art gallery, shop and café. The conversion received many awards including RIBA Award 1999 and Royal Fine Art Commission Trust, Building of the Year. LBA took great care to preserve the outside shell of the Victorian school and even rebuilt the tower to the original design. Contemporary additions include a glass-encased stairway and scenic lift where a popular audio artwork by Martin Creed plays to its passengers. 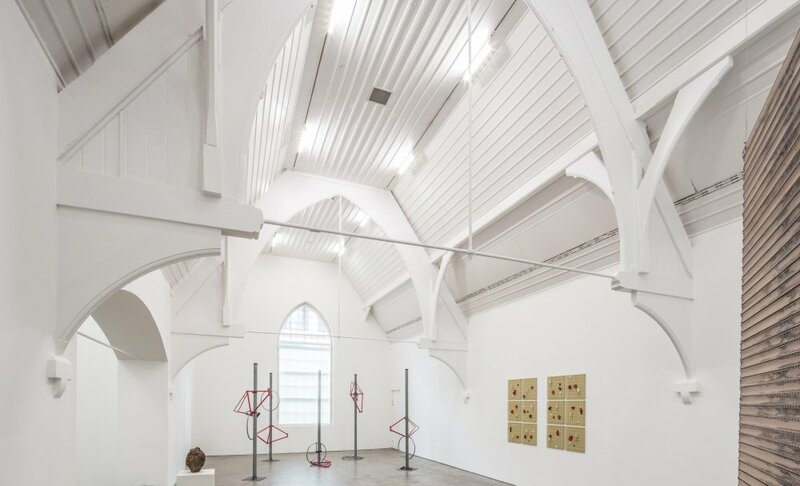 In 2013 Ikon Gallery received a £457,387 grant from the Arts Council (of which £80,698 was spent on the lighting throughout the building) for a number of projects including replacing its visitor and goods lift controllers and introducing a reusable wall system that would help to protect the fabric of the building from frequent installations of temporary walls and window infills. Other upgrades were made to the IT system as well as fixing construction defects that caused leaks in the basement. However, with the wider building project complete, Hogan couldn’t find an LED wall washer on the market to suit Ikon’s needs for the galleries, so they co-produced their own – the IKON LED. A key issue was alleviating the harsh shadows that LED creates (a problem not present in tungsten, halogen or fluorescent), while at the same time benefitting from all the advantages of LEDs – huge energy-efficiency (the gallery is saving over £8,000 per year following introduction of LED), zero UV, colour stability, durability, cooler operation, sustained high colour rendering light quality – and harness the gallery’s experience with lighting to make a multi-solution light. Ikon changes its on-site exhibitions four times a year (down from six due to funding cuts) and these displays vary from artist to artist and exhibition to exhibition, which meant the gallery wanted a light fitting that could be adaptable for each exhibition and artist. 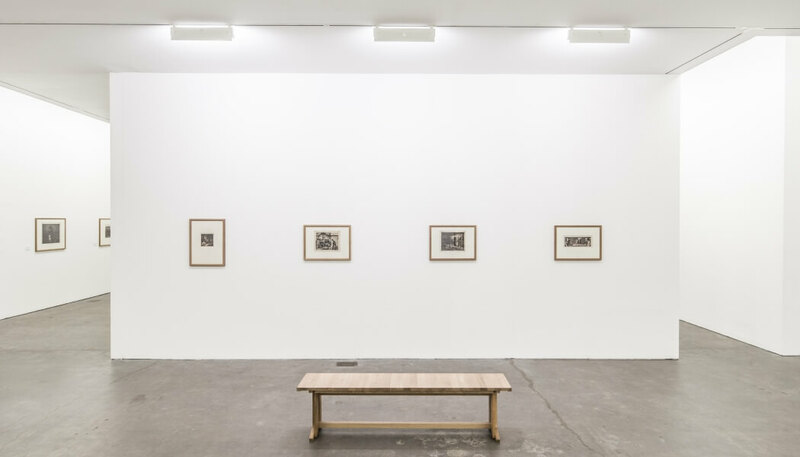 The gallery was previously using compact florescent wall washers and tungsten halogen spotlights, which had a very high energy consumption and were becoming unrepairable and after almost twenty years of service. The BALTIC was originally a tungsten fitting, says Hogan, and effectively the chassis of it was retained to make the BALTIC LED version later on. Hogan also wanted to push the BALTIC LED’s capabilities to use it as a wall washer also and worked with DAL to develop a new reflector-diffuser accessory for the BALTIC which was successful as a wall washer in some instances, but in other scenarios ended up with a scalloped effect and furthermore, in the Ikon’s second floor galleries, the LED spotlights created unwanted shadows. It then became apparent that they needed a dedicated wall washer. Hogan subsequently went across the market and researched galleries and buildings similar to Ikon to seek solutions, especially for high-ceilinged galleries. 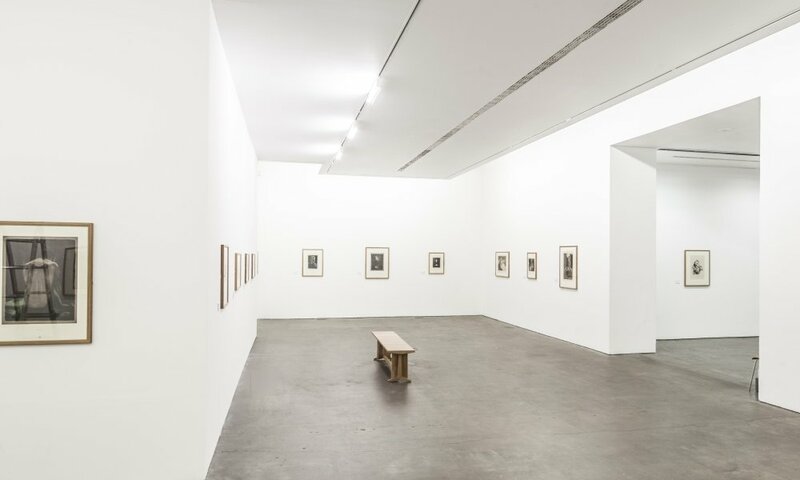 Ikon has two types of galleries, the first levels are almost a typical white cube, box gallery with 3.5m canopy ceilings and on the second floor there are 6m high vaulted ceilings with exposed hammerbeam roof bracing and iron ties across the width. After a visiting various galleries including Tate Modern’s brand new Switch House, Hogan starting to think that maybe there was no other choice but to continue using the old technology. Hogan again spoke to DAL’s Director, Chris Short to see if they were able to fabricate a unit with multiple high quality, LED modules which he could experiment with. Or, failing that, supply a track based fluorescent fitting to create the omni-directional light source in the gallery that he desired. That’s when Short suggested a variation on an existing fixed ceiling product that might do the trick. “They sent through a sample and straight away that was the answer. It didn’t create shadows because it had the multiple LED modules and diffuser combination, which spread the light very evenly. It was a huge sigh of relief. But that was just the beginning. From that fundamental solving of the shadows problem there were a number of modifications Hogan was looking for to produce his ideal wash light that would help galleries’ particular needs. Working with DAL they began to create a fitting that had multiple colour temperatures because, as Hogan put it, some artists and curators want a warmly lit room and others prefer a cooler, whiter colour temperature. The result is the IKON LED Washlight, which, he says, is track mounted with rotating adaptors which keep installation options open across various track configurations. The colour temperature can be chosen between 4,000 Kelvin (cool) or 3,000 Kelvin (warm) using a rocker switch that selects dedicated LED module groups. (Single colour temperature versions of the IKON LED are now also available). Each washlight is locally dimmable and as well as illuminating walls also operates as standard ceiling lighting. “So you can light large floor areas and create ambient lighting as the baton strip rotates through 90 degrees. We added an adjustable baffle at the back. In the lowered position this eliminates glare from behind when installed on low ceilings such as our first floor. 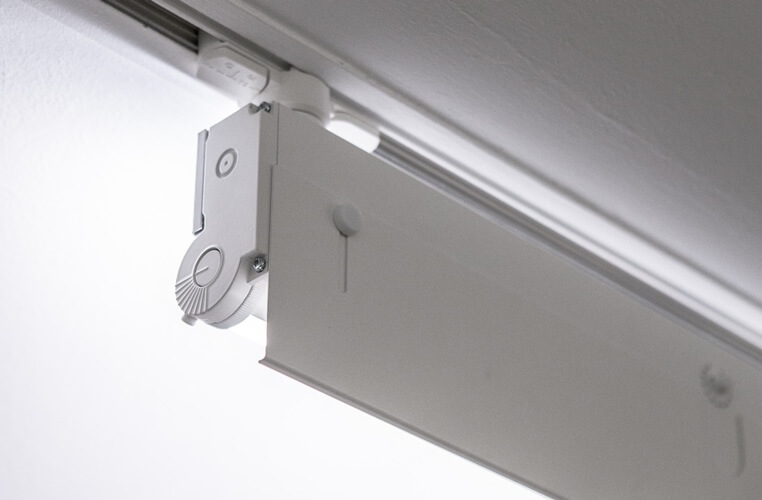 When you lift the baffle you’ve essentially got a strip light in the ceiling that gives you this omni-directional light.” The IKON LED is also fully adjustable by hand, whereas many lights on the market need tools. The new lights came into their own on the first outing for the exhibition Portrait of the Artist: Käthe Kollwitz (13 September — 26 November 2017), which had artwork on loan from the British Museum and Barber Institute of Fine Arts. “We had this degree of control that we had never had before in terms of lux level control. We could dial them down to get bang on 50 lux or beyond to whatever was required. The high to low brightness range is quite incredible”. Ikon is also working with Aston University on intellectual property and other possible applications for the IKON LED. And from the shortfalls of what was available on the lighting market, Ikon gallery is now embarking on an entrepreneurial journey that may well produce future revenue and insight that will feed back into the gallery ensuring that it can do what it is fundamentally there for: be and exhibitor and educator of art.